The Shadeland Avenue Expressway represents a throwback to the early expressways of Indianapolis and is a remainder of the original beltway for the city, or at least what was supposed to be a beltway. Indiana 100 was conceived in 1950s as that new beltway. The highway existed for the entirety of Shadeland Avenue from its southern end near what was Interstate 74 to 82nd Street. The highway then followed 82nd Street west across the city to Lafayette Road (Old U.S. 52) in the far northwestern corner of the county. There was also a third segment that followed High School Road on the west side from Rockville Road (U.S. 36) to Kentucky Avenue (Indiana 67). The stretch from Washington Street (Old U.S. 40) south to a spot south of Brookville Road (Old U.S. 52) was the only part built to freeway-like standards. 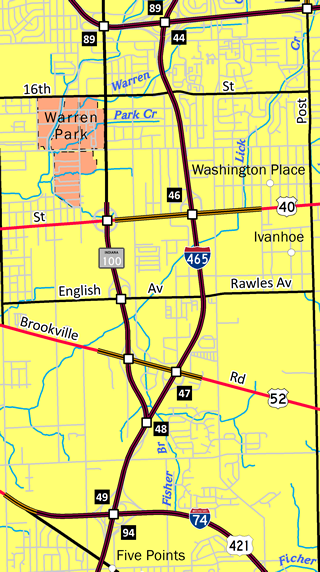 When Interstate 465 was being built, it originally fed into Shadeland Avenue before being rerouted to the east as part of its new bypass around the Eastside. For many years, it served merely as Indiana 100 as a small spur expressway to Shadeland Avenue that was a four to six lane arterial to the north of Washington Street. Slowly, the Indiana 100 designation was decommissioned until the Shadeland Avenue Expressway lost its designation in 1999. Today, the road is simply referred to as Shadeland Avenue and there is no distinction made between the expressway and arterial portions. North of Interstate 465 at Exit 48, Shadeland Avenue is a four lane highway that heads north along its original alignment. Prior to the reconstruction of Interstate 465 on the Eastside in the early 2000s, the interchange between Shadeland Avenue and Interstate 465 was more of a directional Y interchange with the southbound lanes of Interstate 465 going under the northbound lanes for Shadeland. The new interchange configuration had only Shadeland's northbound lanes go over the interstate, which was together in its rebuilt alignment. Photo taken 12/24/11. The stretch of Shadeland Avenue from Interstate 465 to the Brookville Road (Old U.S. 52) overpass was rebuilt as part of the interchange realignment. As well, the northbound exit ramps from Shadeland onto Brookville were removed with a full interchange built at Interstate 465 and Brookville Road (U.S. 52). Southbound Shadeland traffic still has ramps onto Brookville, but for northbound traffic, the first interchange is at English Avenue. Photo taken 12/24/11. A button-copy sign announces the nearby interchange with English Avenue. English Avenue is a local arterial that goes from Arlington Road to the west to Mitthoefer Road (where it is known as Rawles Avenue). The entrance ramp from Brookville Road appears to the right. Photo taken 12/24/11. Now 1/4 mile away from the English Avenue interchange. Photo taken 12/24/11. Now at the folded diamond interchange with English Avenue. Several former automotive plants were present along the western side of the expressway around English Avenue, providing a reason for the expressway, but those have since closed. Photo taken 12/24/11. North of English Avenue, the next interchange is with Washington Street (Old U.S. 40). The sign to the right directed traffic onto what was then U.S. 40 East in the direction of the Hancock County seat of Greenfield. Washington Street for years has been one of the main streets of the city, taking the place of the old National Road. Photo taken 12/24/11. Heading north toward the overpass that carries the Pennsy Trail, a former rail line that was converted into a trail that will eventually stretch from the Irvington neighborhood to the west to Greenfield. The Washington Street interchange is an old cloverleaf that was among the first interchanges built in Indianapolis. Eastbound Washington Street heads through suburban Warren Township and Cumberland on its way to Greenfield. Photo taken 12/24/11. Heading north through the cloverleaf interchange, the loop ramp for Washington Street west is ahead. North of the interchange, the expressway ends and becomes an arterial with the first stoplight at 10th Street. Interstate 70 is about a couple of miles to the north from this location. To the west of Shadeland, Washington Street heads through the Irvington neighborhood on its way toward Downtown Indianapolis. Photo taken 12/24/11. Heading east on Washington Street at the Shadeland Avenue cloverleaf interchange. At one time, the signs read Indiana 100 on them, but have since been changed to read Shadeland Avenue. Photo taken 12/24/11.